Carpets and area rugs are definitely great to look at, but there something extremely unpleasant about them. They are a nightmare to keep clean. The easy and most stress-free alternative is of course to call your local professional cleaners to carry out the job for you. 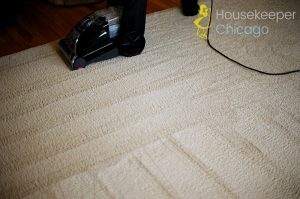 If you want to give carpet cleaning a chance however, here are some pretty useful tips. Vacuum every day – running a vacuum cleaner through your carpets will remove any larger particles and help you avoid building up soil and dirt deep into the fabrics of the rug. If you skip several days of vacuuming, chances are that you will be having quite a bit of issues with keeping the carpets in prime condition, so simply do not do it. All stains should be removed as soon as they occur. No matter whether we are talking about food or wine spills, the longer you wait to treat them, the harder it will become for you to actually remove the damage. Start of why blotting the spot then apply a general carpet cleaning product to the stained area, following the instructions on the bottle, so that optimal results are achieved. A great way to remove bad odor from carpets, including such caused by pet stains, lies in the application of a tested homemade remedy – baking soda. Sprinkle baking soda on the stained area and leave it for several hours to absorb the unpleasant smells. Once you have done that use a vacuum cleaner to remove the baking soda then remove the stain using some of the tested methods for the job. Heavy traffic areas are the ones that deserve most of your attention. Places where people sit or walk the most will wear down the most, and would accumulate the most soil and dirt. Even if you do not have the time to clean all your carpets every single day, it would be more than an adequate idea to set aside fifteen minutes a day to treat the heavy traffic places. When you are treating a wall-to-wall carpet, especially when vacuuming, mentally divide the floor into equal quadrants. Do not move to the next one unless you are finished with the one you are working on. Never underestimate the power of steam. Investing into a steam cleaner, or just renting one when you are planning a thorough carpet cleaning is an eco-friendly and very efficient solution. Steam cleaners come with the benefit that they do not moist the fabrics of the rugs, which means that you will not have to wait for them to dry off in order to enjoy the results of your efforts. As you can see, the key to successful rug sanitation lies in persistence and proper preparation. It Is not that hard at all.